let you know that you have OPTIONS, and what some of these options are. check with your physician for recommendations specific to your symptoms. On Sunday, September 10, 2000, Brian Mullen, age 32, was diagnosed at Emory University in Atlanta, Georgia with Acute Lymphocytic Leukemia (ALL); the Leukemia was present in 98% of his bone marrow. It became necessary for us to explore other treatment facilities. Based on Brian's critical condition and his aggressive Leukemia, American Biologics, with centers in Chula Vista, CA and Tijuana, Mexico, was the best facility to treat Brian's illness. No other hospital was offering an individualized cancer treatment using integrated medicine that could help Brian. .....The physician team at American Biologics chose Poly-MVA as a key ingredient in the treatment protocol to fight Brian's Leukemia. Plain and simple, Poly-MVA has saved my life and let me live and pursue my dreams. After over 33 years of active and reserve service with the United States Navy, I retired at the rank of Captain which is equivalent of a full bird colonel in the Army or Air Force and one rank below Admiral or General. For the 33 years, since age 17, the military gave me 100% of all my physical examinations. .....When Dr. Pepe got the results, he called me in and said “Coach, the cancer center confirmed my suspicions. You have a rare type of blood cancer called Chronic Lymphocytic Leukemia, or CLL.” He also told me that this type of blood cancer has no cure! You can imagine how I felt being told I had cancer and there was no cure. He then told me after confirming with his internist partner, Dr, Michael Falvo, that they were at a medical conference recently and sat in on a presentation about a product called Poly-MVA, which was essentially immune system vitamins chemically bonded to the precious metal palladium. Both Drs Pepe and Falvo recommended that I try Poly-MVA. ....I called Gary, the Senior Consultant on Poly-MVA at AMARC Enterprises, and he told me they were looking for volunteers who had a cancer diagnosis confirmed, especially with my type, to serve as a test group to see if in fact Poly-MVA would work on supporting the body nutritionally to slow or eliminate the growth of the cancer by natural means, i.e. vitamins bonded to the palladium. 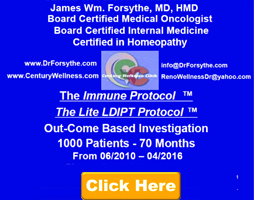 He told me the Poly-MVA product coupled with liquid co-enzyme Q10 (CQ-10) would be absorbed into my body and support my body so to allow my own immune system to combat my CLL. During the following six months and since diagnosis of my disease, I continued on the Poly-MVA therapy as recommended by Gary at AMARC. I had blood tests monthly at M.D. Anderson for over a year and nearly completed the vaccine therapy when the FDA closed down the program as non-effective. "The long-term positive impact I have seen in our clinic is quite astounding. Since 2004, we've performed 3 outcome studies in over 1700 patients with Poly-MVA(LAMC). 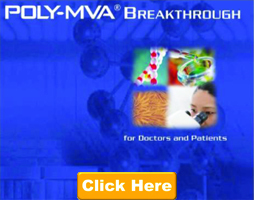 Poly-MVA provides a significant difference as a stand-alone or Integrative Protocol and also continues to show outstanding impact for each patient's success & overall health." The Poly MVA Survivors website is designed for educational purposes only, and is not engaged in rendering specific medical advice or professional services. The information provided through this website should not be used for diagnosing or treating a health problem or a disease. It is not a substitute for professional care.